The name worm is used for many unrelated animals that evolved a slender elongated body shape. It is a basic body shape that works well for a certain life style. When you find a worm-like organism in your pond sample they can be distinguished from each other by their ways of locomotion. Nematodes (roundworms) move frantic in S-shaped curves. Oligochaetes are a class belonging to the annelids, segmented worms. 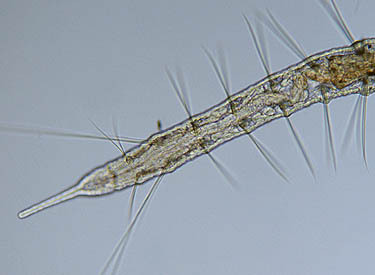 Oligochaetes have groups of bristles (setae) along their body. In the most well known oligochaete, the earthworm, these are so small you can't see them very well but in most pond dwelling Oligochaetes they are much easier to see. Some setae are long, others are small and hooked. The many muscles operating the bristles. They use them for extra grip when wriggling along a surface or through soil. Oligochaetes have a well developed digestive and nervous system. Since they are quite transparent all features of their inner anatomy are visible. 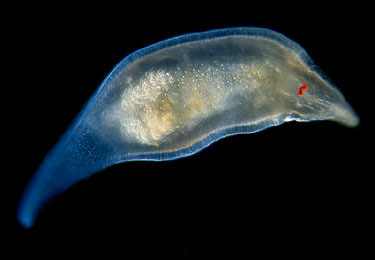 Nematodes or roundworms are somewhat related to rotifers. They have very characteristic S-shaped, often very active movements. The body is cylindrical and the skin (cuticle) is tough and only slightly flexible. Nematodes inhabit all possible environments. They can not only be found in ponds but many species are soil dwellers or live as parasite in other organisms. They form an important role in the breakdown of organic matter in soil and the bottom of ponds. Nematodes have been ideal subjects for scientific study. Scientists have been able to observe and describe the complete development of the body of a 1 mm long nematode called Caenorhabditis elegans. All the cell divisions could be mapped and this gave many new insights in how a multicellular body with all its specialised organs is formed from a single cell. Nematodes have a very limited number of cells (C. elegans has 959 nuclei) and they develop in only a few days (3.5 days). Flatworms (Platyhelminthes) are simple animals. If you observe a flatworm under the microscope you will notice that it is completely covered with tiny hair-like cilia. The beating of these cilia propel the organism forwards, a bit like the ciliates only the flatworms are much bigger. Flatworms have a more or less defined head region with 1 or more pairs of simple eyes (ocelli). They have a very simple nervous system. The gut (intestine) is a dead-end sac that is branched so the food can reach all parts of the body. The mouth opening is situated on the underside, often near the center of the body. The flatworms you will find in ponds are Turbellarian flatworms. Other flatworms like the flukes and tapeworms live as parasitic inside other animals. Some other organisms may be mistaken for worms. Aquatic insect larvae like mosquito and midge larvae have slender elongated worm like bodies. But it is easy to see the distinction since they are segmented, have a head and feet-like appendages. This Hydra has captured a copepod while it is digesting a waterflea. Hydra is a freshwater hydroid (related to jellyfish). Their extremely extendable bodies look a bit worm-like but hydras have long tentacles. Hydra is a very interesting organism that can perform strange tricks. It can turn itself inside out through its own mouth opening. Hydra captures large prey like waterfleas and copepods. 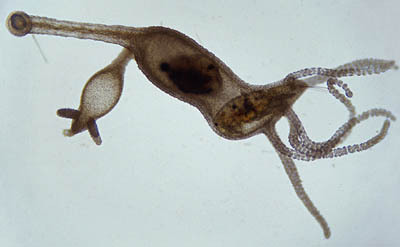 The tentacles are equipped with stinging cells called nematocysts. Like tiny harpoons they paralyze prey. Hydras can be 2 cm long when fully extended and can be found on the leaves of water plants. Put some duckweed and a bit of water in a jar and there is a good chance you may find Hydra.